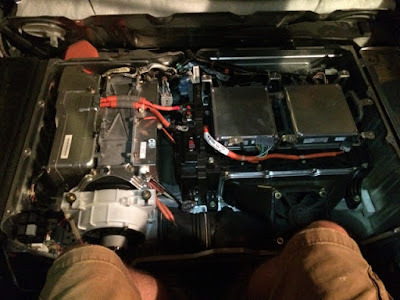 There is a reason I bought a 2002 Honda Insight with 144,000 miles in good condition for only $2,400, I knew I was going to have to replace the hybrid battery. 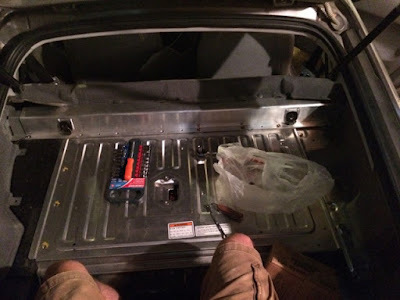 Replacing the battery is a $2,000 to $3000 adventure. When the IMA light came on initially, I didn't think it was a huge deal, and I continued to drive for a few weeks normally. Then came a day when the battery drained to zero, and didn't immediately recharge. At that point it was like the computer was commanding electric assist, and thinking it was happening, but there was no electric assist. I basically had to floor the accelerator pedal at every stop sign and red light to start moving again. Needless to say, this wasn't going to work forever. 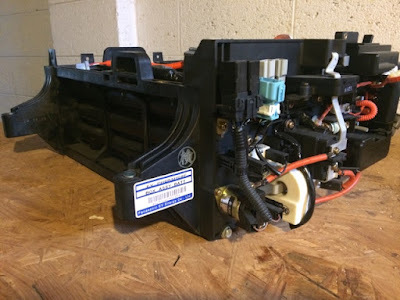 I took my 2002 Honda Insight into the local Honda dealership in mid September to have an oil change, my first while I have owned it, although I did only put about 5000 miles on it in the last year, and also to have them look at the IMA battery light. They confirmed that the battery was bad and needed to be replaced and told me it was in the neighborhood of $3000 for parts and labor. I knew that going in, actually, I was surprised that their estimate wasn't higher. In fact, getting a little mechanical and electrical experience by personally replacing the hybrid battery was part of the reason I bought this old car. I told the service manager that I would like to do the replacement myself and he seemed surprised, I think it was the first independent hybrid battery replacement he had heard of. All told I made it out of the dealership with a bill for $155 for the oil change and labor time inspecting the battery and controller, which they confirmed was working correctly. Which is a reason I typically don't go to bar dealerships for service, it's expensive. It is worth mentioning, in ten months of ownership this is the first service bill I had on my Honda. Other than this I have only paid for gas, and a $30 or so kit to clean the headlights which were clouded from 12 year old plastic. The next step was to purchase a battery. I bought mine from Bumblebee Batteries out of Portland, OR in early October. They advertised more battery capacity (8 amp hours versus 6.5), a 20 minute video above on how to remove and install the battery, and they had positive reviews. The cost came to $2,770, which is more than I paid for the entire vehicle, that that also included $500 which would be refunded when I return the old hybrid battery core, or rather enticement module. I sent the module back before Thanksgiving. There was a delay because I wanted to tear down the actually battery before I sent it back. I also had to buy some tools, about $40 worth of sockets and wrenches. 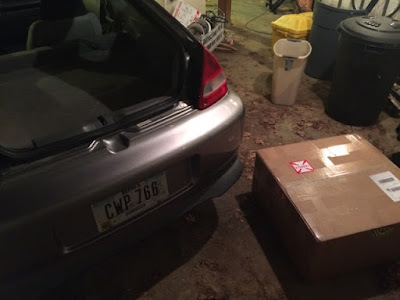 An 80 pound package beside a car! To be honest, following Bumblebee's video, the extrication went really smoothly. The worst part was the big 12 mm socket bolts behind the passenger seat. I just could not quire reach it and get more than 15 degrees of wrench movement with my three inch socket extension, and had to go back to the store and get a 6 inch socket extension, which I then used a cheater bar on to get a little more leverage. I don't like getting dirty. The concept of digging into a bunch of oil and grease for fun isn't that fun for me. However, I really like turning wrenches and seeing how things work, and doing physical work. In other words, electrical and structural work, which is relatively clean, like the work to replace the hybrid battery, was great fun for me. Sure I can have a good time working on an engine or hydraulics system, and I like the physical experience of working on things that I sit behind a computer all day starting at, but I am just not a fan of getting covered in oil. The battery went in very smoothly. I think it took me around three hours of work in the back of my car, plus another hour going to the store to buy tools. The battery took maybe 1:45 to get out, and the new one went back in the car in just over an hour. 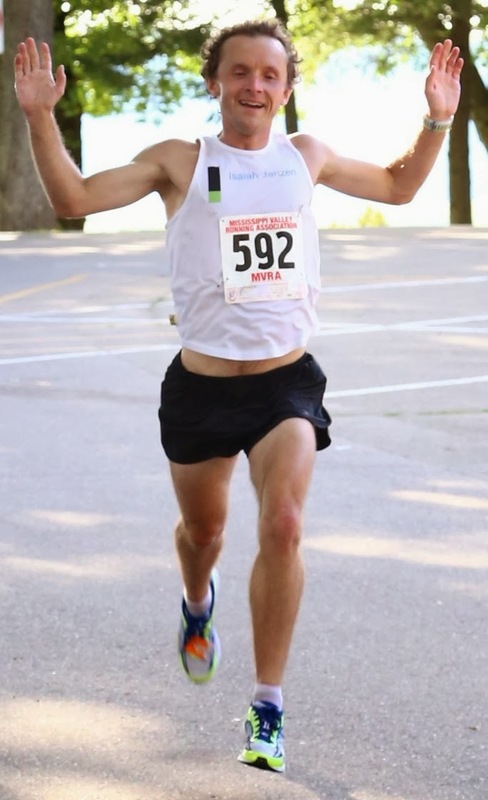 Like any other project, the first time you do it is the hardest because you have no idea what you are doing. 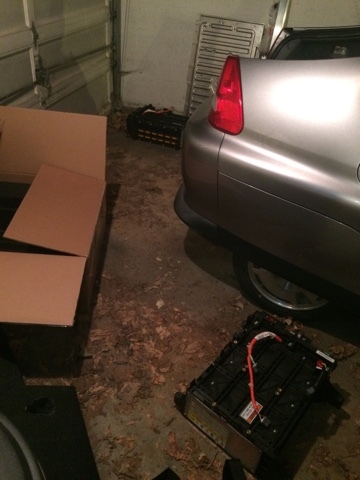 Two hybrid batteries beside a car. Removed white plastic cover and several bolts. Remove the bolts and screws on both orange plates, the screws are very small. Pull out a battery. I bolted small plate to it and pulled it out with a wire. When I finally pulled out the actually batteries they had a plastic shrink wrap over them, and the only way I was getting in there was with a knife, and frankly, I wasn't ready to do that. My concern was that the shrinkwrap probably keeps the six batteries together and I might have trouble keeping them together if I go at it with a knife. 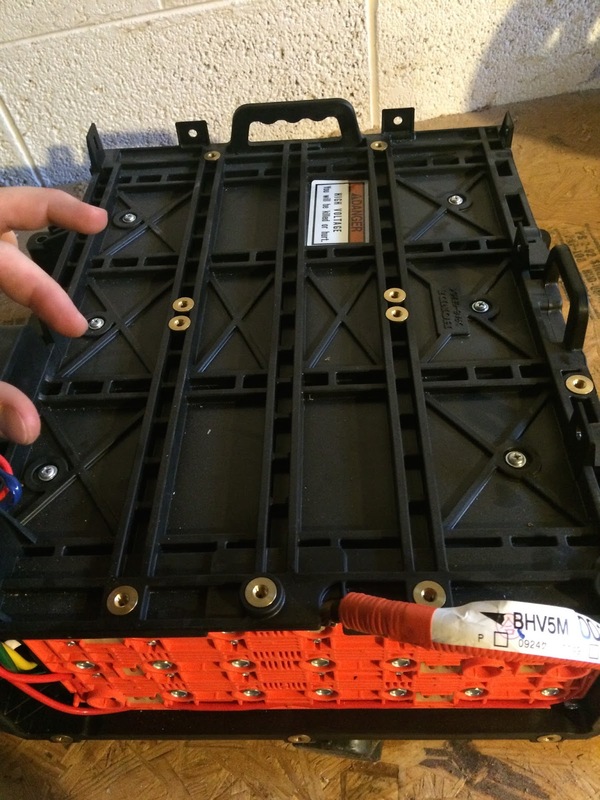 Six 1.5 volt cells in each "battery" and 20 "batteries" in each module connected in series is 180 volts, most much higher than the 144 volts rating of the battery pack. In other words, if two cells within a "battery" are not touching, the whole thing might not work. 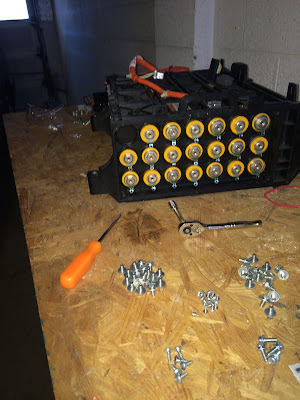 Of course, once bolted into the battery frame there is pressure on the batteries so it probably would not be an issue, especially I returned this to a guy that is probably going to tear them apart and replace them anyway. The end connection has a threaded hole and thin electrical tab. 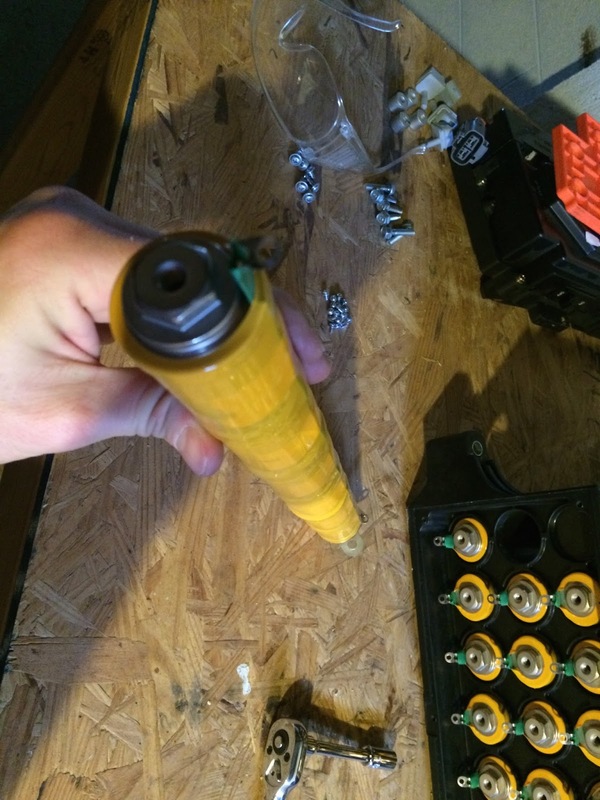 Looking Inside the "Battery" tube, notice the four rubber flaps to help stabilize the "battery". 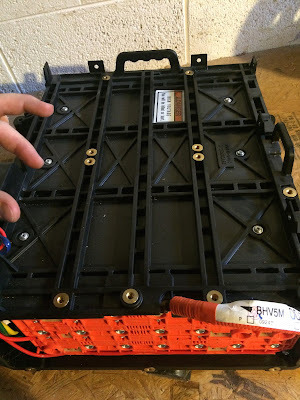 Be careful aligning the electrical tab on each "battery" with the slots in the orange plates, it took me several tries, because I had to straiten them all before putting the orange plates back on, then bend them all to screw them back into the orange plates. The 20 "batteries" shown with their electrical tabs bent down, and the hardware I took off to get that far. All the battery pack required for this much disassembly was a 10 mm hex socket and a phillips screw driver. When you put it back together, watch out for the four bolts that go from the control panel into the batteries, the ones hidden behind the rubber plugs, I shocked myself by holding the lower left bolt and then the bolt closest to the middle. It was definitely more than a standard 9V battery shock, but way less than sticking a knife in a 110V 15 Amp outlet. Honestly the dead battery pack might only have like 3-4 amps at this point at 144 volts, assuming that I got the full brunt of the battery pack, not some subset. Remember, it's the amps that kill not the volts. Showing the recessed bolts that might shock you. The process to replace the battery itself was very strait forward, it followed the Bumblebee video exactly, there were no design changes that were different between the video and my car. Would I do it again? 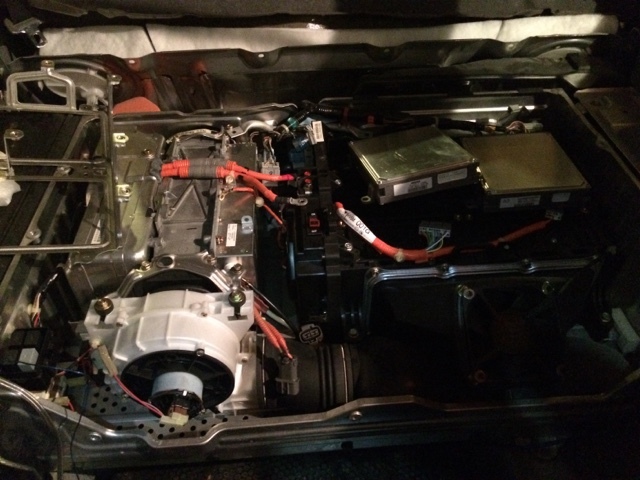 Well, my parents recently bought a 2014 Prius C and I would be interested down the line to try and replace that hybrid battery. In other words, yes I would do it again.